6-1 Avalanche win tonight. Doesn't get much better. I was like a kid, sitting on the bench kind of re-living the Vernon fight and the Osgood fight. It’s kind of similar, pretty cool. I’m giddy right now. It’s so fun to win like that and such a difference from the last few years. (Roy) is leading the charge here and we’re ready for it … Maybe it was a little much at the end there, but that’s alright we sent a message. Bordy threw a head fake on the guy and it kind of went from there and it turned into an old-fashioned donnybrook. It was old-time hockey. Hopefully we’re sold out after next game after that. I don’t think the fans could ask for anything more than we gave them tonight. Patty (Roy) said nothing crazy at the end. They for sure rushed at us. I didn’t even hit the guy in front of the bench. They rushed at us, like three guys, so me and McLeod dropped the gloves to get ‘er going. When it’s 6-0 I don’t think this game needs this type of cheap shot. But after that obviously there was some talk from coaches, I guess, but at the same time what should I do? He put his fourth line on the ice and I’m not going to go with my first line, and I went with my fourth line and that’s it. I’ve been matching (lines) all night long by the way. Hey everybody. It's been awhile. Seven months to the day, in fact. In the months that I have been gone,, Patrick Roy and Joe Sakic took over the organization, Alex Tanguay returned, the Avalanche drafted Nathan Mackinnon first overall, and yesterday, the NHL adopted hybrid icing for the 2013-14 season. I also took the LSAT, got into law school, and I am currently enjoying my senior year at Cornell. I'm sure some other stuff has happened, too - but we're going to pretty much start clean and ignore everything. There are a ton of great Avalanche blogs out there, and I make daily trips to Mile High Hockey and the Denver Post to make sure that I know everything going on with the Avs. I guess there's that Twitter thing, as well. Anyway - the NHL season is set to begin tonight, although the Avalanche won't play their first game until tomorrow. It's a tradition on this blog to record some random thoughts before each year's first game. -The Avalanche get off to an 8-3 start under new coach Patrick Roy. The Avs lead the league on the power play at 30% in the early going, but struggle on the penalty kill, managing to only fend off the man advantage 83% of the time. -It takes me the entire year to figure out who is in what division. Seriously, who is the favorite in the Atlantic this year? The Penguins? Wait, the Penguins aren't in the Atlantic? Where then? So who is in the Atlantic? The Canadian teams? And Tampa Bay and Florida? 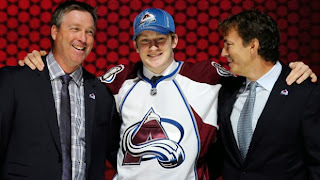 -Erik Johnson will finally have the year that Avalanche fans want him to have. EJ will reach double digit goals for the second time in his career and also put up a career high in points. -Alex Tanguay scores 20 goals and helps rejuvenate Paul Stastny. Per usual, however, Stastny has to deal with an insane amount of rumors before the trade deadline. It's a contract year, though, which means Stastny may find himself as the odd center out before the year is done. -The news won't be so bright for Steve Downie. The injury-plagued agitator will miss big chunks of the season. -Downie's loss is Cody McLeod's gain, as the fiery ginger tallies 26 points - a career high. -Ryan O'Reilly will be on the team at the end of the year. Under the old regime? Not a chance. But this is a new day. Keeping O'Reilly is best for the team, and he'll earn his big paycheck playing alongside Matt Duchene. -My birthday present this year was a Duchene blueberry jersey. Can't wait to wear it to some games this season. -Tyson Barrie finally becomes a stable force on the back end. Not so sure about Stefan Elliot, unfortunately. -Personally rooting for Brad Malone to get some NHL time. Enjoyed watching him in college. I think he can really contribute on the fourth line for the Avs, and he should get the opportunity at some point this year. -Under the guidance of Roy and new goalie coach Francois Allaire, Semyon Varlamov rebounds from a lackluster season and has a 30-win year for the first time in his career. -Biggest Avalanche question: Can they avoid the injury bug? It's the one thing that will stop the offense from succeeding. Good thing Colorado has a million centers ready to go. -Division Winners: Pittsburgh, Detroit, Chicago, and Vancouver. -Other playoff teams in the East? include: Boston, Ottawa, New York Rangers, New Jersey Devils, Columbus, and the Islanders. -In the West? : San Jose, Phoenix, Los Angeles, St. Louis, Nashville, andddddddddd...Colorado. -Seriously, though, I have no idea how the playoff picture is going to look this year. The new format is bizarre, and I honestly think it's pretty wide open in the West. -Nathan Mackinnon will win the Calder by leading all rookies in scoring. Doesn't mean he necessarily will deserve it, but hey, it worked for Landeskog. -Not seeing any Adams love for Patrick Roy. If the Avs make the playoffs, he'll obviously get serious consideration. Following in Joe Sacco's footsteps, perhaps? -Sidney Crosby is going to be great, but Evgeni Malkin will be extraordinary. -Woe is the Flyers' goaltending. Steve Mason and Ray Emery. Really? -Assuming I have understood the format correctly, I'll take Detroit and Pittsburgh in the East and Chicago and St. Louis in the West. -A terrifying Detroit-St. Louis Final ends with, thankfully, the BLUES hoisting Lord Stanley. -How hard is it going to be seeing Chris Stewart and Kevin Shattenkirk hoist the Cup? In your face, Mr. Sherman.